Nürnberg that afternoon was pretty chilly; I could even feel the 2°C air in my bones. My bus to Prague came late about an hour, so I took a walk to a nearby Christmas market and bought a Nutella waffle to warm up my body. When the bus finally arrived, I picked one of the empty seats. Someone next to me was chewing an M&Ms while resting her head to the foggy window glass. I was too tired to say hi. I didn’t remember anything until when I woke up in Rozvadov, a village in the border of Germany and Czech Republic. “Some touristic places I learned from Lonely Planet,” I answered. “Are you interested to go underground?” she replied. What came to my mind when hearing “underground” was either metro, pipelines, moles, worms, or rats. Or if I had to be a little bit more positive, it was either underground culture, music, or parties. She could read my confusion. I had to agree because it was actually part of our deal. My mission in Prague was to have a Christmas dinner in a local family’s house, but no one from CouchSurfing approved my request. I previously told her about that, and surprisingly she invited me to her parents’ house for the dinner I had been craving for. I was freakin’ happy! 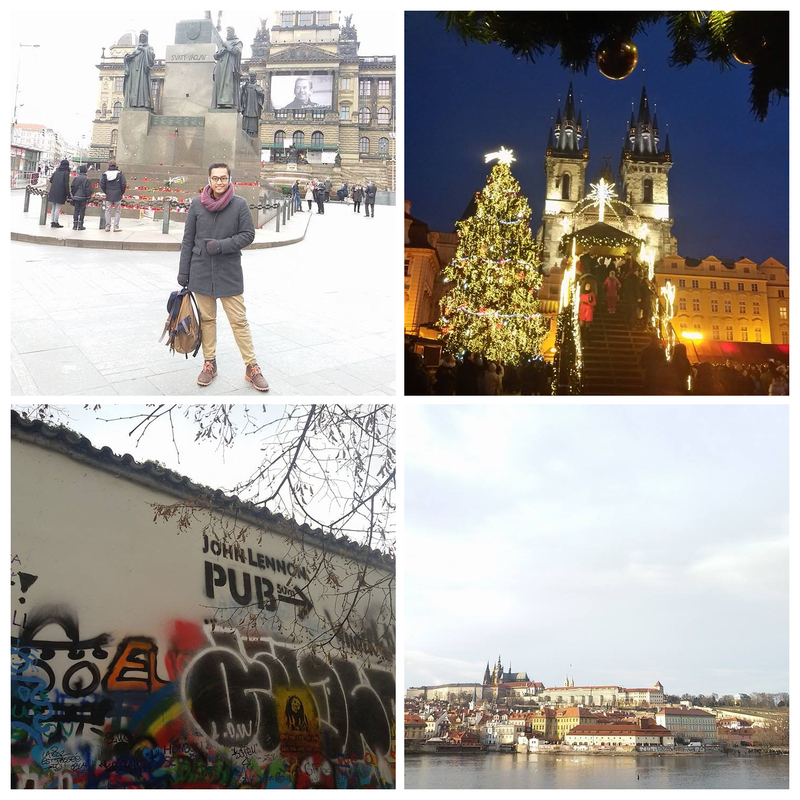 But that invitation came under one condition: I had to go with her to stay away from Prague’s tourist classic, learn local insights from the expert, and act like a real Praguer. Actually it didn’t really sound like a “condition” to me. It was more like a bonus complimenting the Christmas eve’s dinner (click it if you speak Indonesian and want to know about the dinner story). The morning after the dinner, she brought me to several interesting spots I didn’t know before, such as Cross Club (an industrial and weird-looking underground club with all-metal design), Kavárna Muzeum to eat 14 (yes, fourteen) delicious variations of the legend Czech bread, and Dlouhá street that has a stretch of bars and pubs. Beer, beer, beer!!! Czech Republic is famous for its delicious brews of heavenly beer, and they’re proud of it. They have the best beer (according to them), and it’s cheap. Cheaper than water! They have the highest beer consumption in the world: more than 156 liters of beer per capita each year, and that includes old people, newborns, and dogs! But don’t call them drunkards, they prefer “beer expert”. She couldn’t turn me to be a beer expert (naturally I’m not a beer person), but I became more expert in saying some beer-related vocabularies in Czech: hospoda = pub, pivo = beer, dám si pivo = I want beer, ještē jedno = one more beer, panák = shot, and na zdraví = cheers! Not only beer, they’re also mad about beer foam! 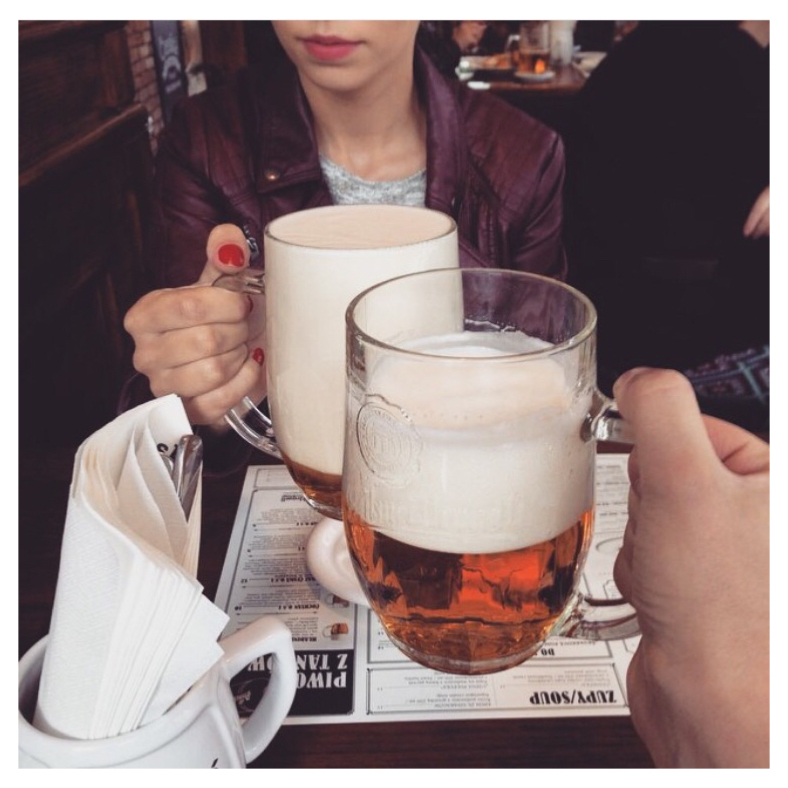 A restaurant named Lokál believes that a properly poured Pilsner always comes with a verryyy thick layer of foam on the top to keep the flavor of the beer fresh. And guess what, the costumers can even ask for a glass of beer foam! It’s called mlíko (milk in Czech language), because it looks like a glass of milk. It’s not beer, it’s not milk. It’s mlíko! In some modern pubs, the waiters will give you four glass mats. Wave the green one to order one more beer, blue one to get a menu, yellow one for a round for everybody, and red one to pay the bill. What an interesting way to communicate! No more waiting and shouting like crazy. Sad news: it’s forbidden to drink alcohol publicly here (at parks, islands, squares, streets), except in New Year’s Eve. Enough about alcohol; she also gave me some transport insights. First, public transportation is always cheaper than taxi (cabbies are even considered robbers) and often faster. The tickets can be easily purchased from the yellow vending machines and newsstands, cheaper than if you buy from bus drivers. Second, the price is determined by how long you’ll to use it, not by how many transfers you’ll make. 24 Kč (1 euro) for 30 minutes, 32 Kč for 90 minutes, 110 Kč for one day, and 310 Kč for three days. And third, don’t ride historical vehicles or horse carriages, they’re all traps! Most museums are closed on Mondays, many shops are closed on Sundays (except in the downtown). Restaurants open until 9 pm. And when you eat at a restaurant, they have a special tip-giving system. When you receive a bill, use the easy math by rounding the number up and tell the waiter how much he should keep, at least 6 Kč. For example when the bill is 143 Kč you can say, “150 Kč is okay.” But when it’s e.g. 148 Kč you should leave 160 Kč. Please, don’t call them “post-communist country” or even “Eastern-European country”. They prefer “Central Europe” that also includes Slovakia and maaaybe Poland. 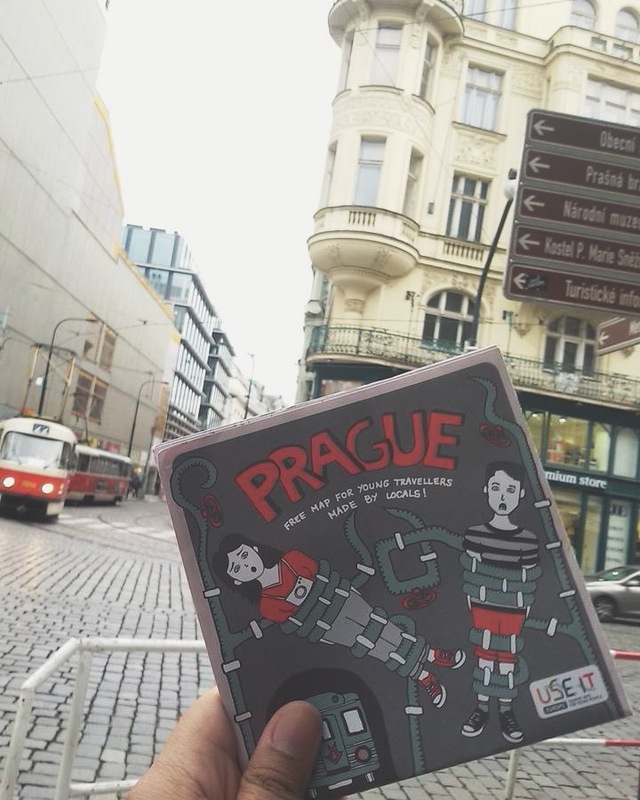 Some local tips can be found on this booklet; grab it free anywhere in Prague! Those insights were very useful for me, and will always be, especially if I revisit Czech Republic one day. I believe it’s useful for you too, because there’s no better way than enjoying a city like its locals. I’m glad she and I met in the bus that day. Oh, her name’s Andrea by the way. We remain friends until now. Previous The World Changes. So Does My Travel Plan. Hi thanks Erin for visiting. 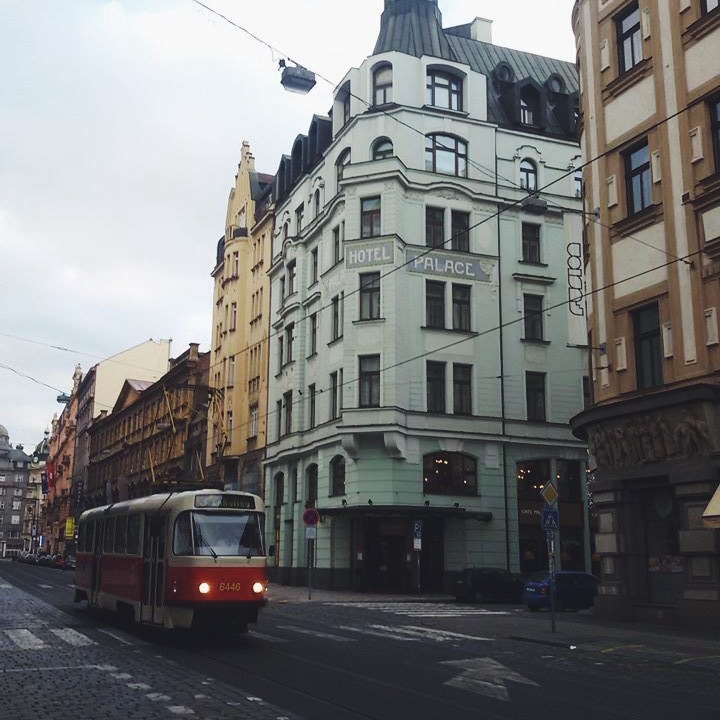 Yeah Prague is cool, even though it’s not my kind of city because it looks too old haha. I went to Lublin after Prague, lovely city. Where exactly do you live in Poland? I lived in Radom, Poland it’s about an hour south of Warsaw. If I ever moved back there I would rather stick to the big cities though like Warsaw, Krakow or Wroclaw.